Webflow is quite an unusual website builder. It isn’t similar to other services that come with visual editors as well as to the majority of CMS. The service uses the format of working process presentation, which is not unique, but quite rare for SaaS platforms. The system mostly resembles advanced web design programs like Adobe Muse or even Photoshop, in which web developers prefer to draw web page templates. It is not meant for bulk usage by newbies. Webflow is positioned in the following way: if you can imagine the final result, you can bring it to life. In other words, there is a distinct hint on flexibility and the need of certain website creation experience. The target audience of the service includes web masters, designers and freelancers. The system promises to provide clear code on the basis of your visual creativity. You won’t need any coding skills here. It’s possible to create business websites, landing pages, online stores, blogs, portfolios and their combinations with the system. Is it really interesting? If so, then who might wish to use the service? Let’s find that out. If you are interested in filling out the templates designed for the completion of certain functionality and logical connections with content, then Webflow won’t work for you. This website builder is not meant for those, who look for simple solutions and wish to publish a website during one night only, having returned from the main job. To gain success, you will need skills and clear understanding of the final goal. The system is oriented on web developers, who can use the templates to create the required structure and make up logic connections between the elements on their own. In other words, it offers creative and thoroughly thought-over web building approach. If a user has never been involved in website building, he/she runs a risk of being unsatisfied with Webflow. Yes, you can just fill out a ready made template with your own texts, links, images and other content. Unfortunately, the prevailing amount of system features will be left ignored in this case. For such a scenario, there are other, more convenient and intuitive website builders. To use this CMS, you have to work hard to create a stunning project. It’s not meant for everyone. The service is not about simplicity at all. The interface is logical, but specific. It is well-structured and even convenient after you get used to it, but newbies won’t be able to master it quickly at all. It’s really complicated to learn how to use it properly. This usually takes several weeks. How much time does it take to become a web designer or a Photoshop pro? The same is about Webflow. Does it take a week, a month, a year? This depends on you. Webflow idea is about providing users with maximum design customization features and functionality without any coding. 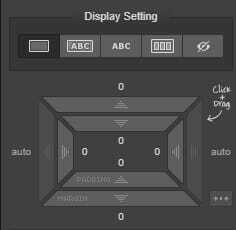 It’s not a secret that visual editors set the limits by the amount of widgets and their settings. This is not bad as it’s convenient for everyone, especially for newbies. It turns out that it’s impossible to edit the code here. So, where does such template formation flexibility the developers are proud of come from? This question was solved by the introduction of the list of elements with unique identifiers – ID selectors. You can choose their names as you wish, but it’s still better not to do that. This is because they come with logical naming by default. The style manager has an exhaustive list of elements used in templates. Is it convenient? So-so. It’s rather unusual. 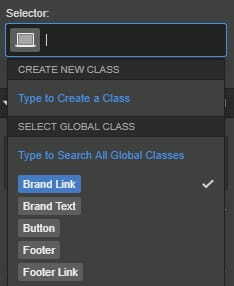 You can create your own classes, add new ID elements. This is all provided in terms of the graphic interface to make it possible to state that Webflow doesn’t have any coding, but you can still make use of its power. Does such an approach actually simplify the process? No. You still need to understand the logic of class application, keep in mind the names of the most frequently used IDs, browse the list in search of the names of more rare selectors. Frankly speaking, it’s simpler and more useful to learn HTML/CSS – this is the universal knowledge, which will come in handy to you in any web building niche. A convenient feature is that the ID of elements and the entire block hierarchy is highlighted on a template, when clicking on them. This is a nice crib sheet. You can highlight several elements and set general settings for them. The number of elements is really impressive. In other words, CSS features like spacing, sizes, layers, colours, alignment etc. can be edited in the graphic interface. This can be done by changing the number volumes, slider, icons and other manipulators. The “Navigator” section provides an overview of a tree-like block and element structure of the chosen template page. Correspondingly, you can quickly proceed to editing these elements with its help. You will see and understand the structure hierarchy. This is done greatly, although, newbies will have to get used to that. The feature is mostly geared towards experienced users. The structure of the Webflow visual editor and dashboard is quite complicated. 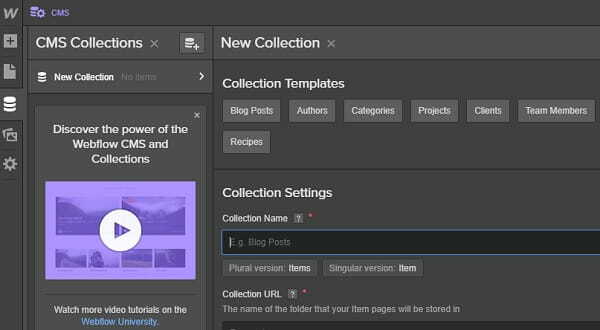 This is the mixture of a traditional visual editor, general settings section, a panel with standard widgets, structure of folders and modules to display the dynamic content, which are called “CMS Collections”. There is also an image library, template mode switch (desktop, mobile etc. ), various element highlight modes and other useful things. By the way, it’s possible to work with website templates in two modes here (the switch option is in the Dashboard). The first one is the Designer mode, the description of which is used as a basis for this review. The second one is the Editor mode. The latter variant allows editing the web page content – add the text, replace images, links and graphics. Just hover the cursor over any element to see the settings with available actions. Then make the edits and that’s it. This is a convenient mode to make quick edits. The Design mode offers multiple widgets. You have a canvas (web page template), within which the div-blocks, sections and less important elements are found. You can’t just drag the widget to any place as it is – you need to understand the logic of interacting with the structure. In most cases, you need to add a blank block and fill it with sections layout, columns and write in the forms, text, images etc. Examples of widget names (elements) are as follows: div-block, section, container, columns, list, button, title, abstract, link, complex text, form, entry field, checkbox, captcha, code integration (it’s possible! ), social networks, standard and pop-up windows, background video and more. 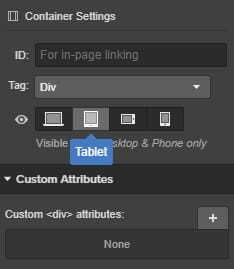 You can set up the display parameters and characteristics of each of these elements in details after you add them to a template. It is also possible to use identificators (symbols) – saved blocks with ready made design to come up to any task. Suppose, you have created a successful review block or a form for something. You can create identificators on their basis and add them from the bookmarks further. You can adjust visibility for various types of devices and for separate elements. All the saved web pages are structured in folders. For example, there can be several templates of the Homepage, Contacts and other pages within one template. It’s possible to create new folders or pages as a blank canvas to further work with it. 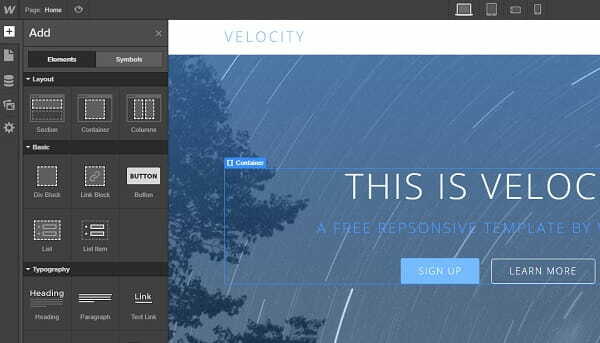 Generally, Webflow creates an impression of an advanced graphic web editor. There are multiple ready made elements here, while the number of those you can manually create from scratch is much more impressive. There is also the trigger element management system. These are the actions you can make when hovering the cursor, click, scroll etc. over a certain element. You can manually set up the character of any amount of separate elements and website pages. For example, it’s possible to display the animated dialogue window, when the web page loads on smartphones. The editor lets you set up quite complicated and versatile scenarios of website interaction with visitors. Collections are the major Webflow highlight. They make it possible to create dynamic structures from combinations of fields with diverse content. They use databases to update and store information. Flexibility of settings is impressive. By using them, you can create forms, blog feed formats, galleries, event posters, menus etc. Application scenarios are numerous. There are ready made templates of field sets used to solve various tasks. It’s possible to increase this number as this feature helps solve specific tasks with creative approach. All your projects are displayed in the Dashboard: edit, duplicate, share and sort them out into folders. You can also have a look at the impressive list of button combinations available for use in the editor, when you access the system for the first time. Each project has a rich number of settings – from a website name and favicon and up to code integration, connection of external services, SEO and backup work. There are many useful and simply interesting options in the project settings. For example, those users, who work on the development of client websites, can provide website access to their customers so that they could manage the project and make the edits within the limits you specify. You can set up project branding by removing the service logo or connect Google Fonts/Adobe Typekit and choose those fonts you will use in terms of the project. Another option is to upload your own fonts. Much attention is devoted to project SEO optimization. 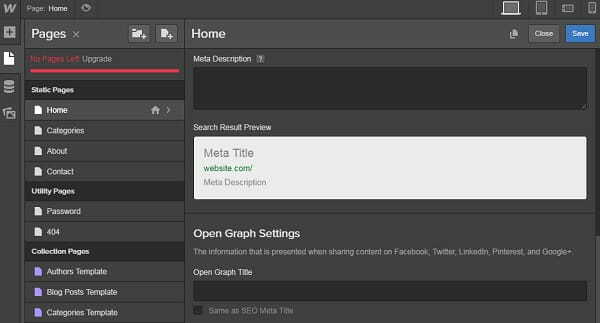 It is possible to set up the content of title, description and keywords meta tags for each page. You can also work on the content display in Open Graph. Alt tags for images can be set up here as well. Sitemap.xml is formed automatically – just like the meta tags for blog feed posts. Taking into account quick web page loading, high code quality and optimization for mobile devices, the website builder can be considered a nice solution for the effective website promotion. Webflow grants API access to web developers. You can connect Google, Facebook services, add Webhooks, set up the parameters of user information collection from the forms, activate anonymization of user IP addresses, add your HTML/CSS code, language code etc. Websites will be published on the service subdomains by default, but it’s also possible to delegate the domain or even export the template code (separate HTML/CSS/JS/Assets). CMS files won’t be saved in this case. Generally, Webflow is a grim mixture of Photoshop, SaaS service with a visual web page editor, tools to work with databases and code in somewhat specific mode. This is a flexible combination of options packed in a complicated, but quite logical interface. The system can be used to create web page templates for other CMS like WordPress due to the code export option. The product is obviously powerful, interesting, oriented on designers and developers of client websites. Webflow stands out from the crowd due to the set of stunning ready made templates. They are very versatile and appealing. They trigger genuine interest on the preview stage. All in all, there are around 200 templates here. 30 of them are free, while the cost of other themes ranges between $24 and $79. There is no distinct difference in quality of premium and standard templates – all of them are impressive in their own way. The number of paid themes is larger and the assortment is wider. Each template comes with a description of features and there is also a preview option. The system offers an opportunity to draw a template from scratch by using a blank canvas. It’s also possible to select general design without demo content – the one, which will come with a schematic layout for a business website or a portfolio, for example. Many templates have several variants of web page presentation – they offer 5-10 Homepage themes, Contacts etc. The design differs a lot and it’s possible to switch between the templates in one click. Each theme comes with an instruction – the description of its structure and major features. Webflow is a design-focused website builder. Template variability is really striking. It’s possible to edit each element in numerous aspects: size, position, effects, rotation, opacity, layers, colour, background etc. There are millions of combinations here. You can have a look at the works of other designers in the Dashboard – there is much to see and to get impressed here. The service gets the highest rate for an advanced potential of template development. This is the tool for pros, which can impress everyone by the range of website design customization options. Webflow provides perfect conditions for the education of newbies. There is the University, an impressive knowledge base, multiple video tutorials here. All these options are available directly in the editor. The quality of materials is on the top notch level. There is also a blog and a forum with a rich number of useful posts/discussions, social network groups, tutorials, books etc. – you won’t get lost here. Tech support is provided via the email and online chat. It is qualified, user-friendly and 24/7. Webflow community is quite wide and friendly. It’s not a problem to find the contacts of the best designers or trusted web developers here. The ecosystem is live and responsive. The system has made everything for users’ comfort and even more. $16/mo, Lite – 10 projects, client billing, code export. $35/mo, Pro – unlimited number of projects, opportunity to remove the service logo, password website protection. $70/mo, Small – unlimited number of websites, 2 users, 100 pages on 1 website, creation of 100 templates, website exchange with other system users, activity tracking of a team member. $140/mo, Medium – 4 users, the rest of the features are the same. $280/mo, Large – 8 users, the rest of the features are the same. By the way, freelancers can use Webflow for free due to the client billing opportunity. This means that you don’t have to pay for the engine, when working on the development of client websites. Instead, you can discuss the cost of the tool with a client in advance so that he/she could make a payment. A client will get access to the system to be able to watch the web design progress. Thus, you can use Webflow on a Lite plan to create templates for other CMS due to the code export option. In other words, you can consider the service as a combination of a graphic editor and a tool to design web pages. You can avail this option at $16 or $24, if you make monthly payments. You cannot remove the ad here. That’s why, this plan cannot be considered for publication of client or personal commercial projects. Pro is a plan that will work great for the majority of users. This is a nice choice for designers, freelancers and other users, who want to design websites for personal use. The cost is quite high, but the Webflow audience is conscientious as well. Outsiders will hardly be interested in such a complex tool. Generally, the cost of $35 is ultimately justified. Team plans provide complete functionality, being different in the amount of users, who have access to website development only. This is quite understable: you upgrade the plan and keep working as your team grows. Webflow is a specific service, which targets the experienced audience. It is quality, flexible and contains numerous brand features that can attract the attention of client website developers. The system doesn’t work well for personal use – there are too many extra and obscure features for newbies here. Web design skills are obviously required. The learning curve is high. This is not profitable at all. It’s more beneficial to create the only portfolio or business website in uKit, Wix, XPRS or any other suitable service. Quite powerful ecosystem: tech support, tutorials, user community. Comparatively high cost for those, who need 1 website for personal use only. Webflow is a decent product for its audience. This is not a bulk solution for bored newbies and fans of experiments. The major disadvantage is that the developers have introduced an effective, but not universal scheme of working with ID elements and CSS classes, being driven by the desire to make the interface more user-friendly. Anyway, they have left a code editing option. It would be better, if they integrated web page code editing along with other features. As to the rest of options, they are on a decent level. There aren’t many competitors or alternatives for a service like this. The closest rivals are WordPress, Adobe Muse and Webydo. But we also compared the editor with some of the most popular website creation options for you to see the differentiating factors. 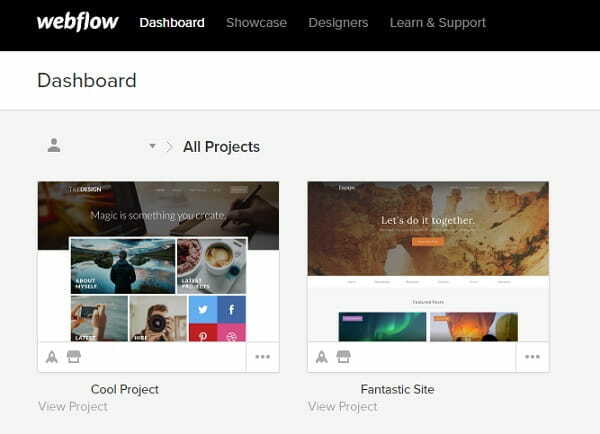 Webflow is an extraordinary, quality website builder for designers and freelancers. It lets you create multi-page websites with quite complicated functionality due to the use of complicated, dynamically changing content forms – see live examples made by Webflow users. Databases, integrations, identificators, various editor layout modes, opportunity to edit each block and element separately, template code export – all the features make Webflow a real giant. Great tutorials make it possible to recommend the system to enthusiasts. Having worked with it, you will, probably, learn how to design appealing web pages without coding. This guarantees decent profit in future. If you already have the experience, then you should definitely consider Webflow. This is a rare niche product of high quality – the mixture of Photoshop, Muse and CMS provided in the format of a SaaS platform. The service is certainly worth its cost, but it won’t work for everyone. We recommend it for consideration of the target audience.